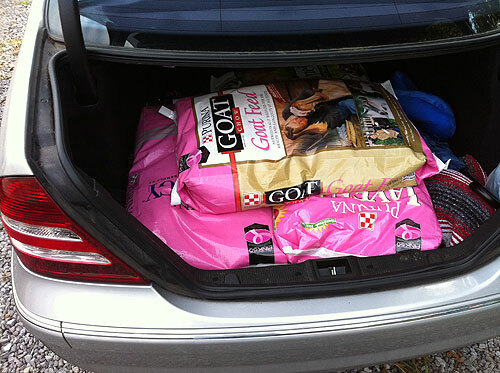 If you use Purina feeds, by now you’ve noticed the pink bags. About a month ago we noticed the first batch and ended up coming back from the feed store with a trunk full of pink (we primarily use Purina Strategy and Equine Senior). I was surprised and impressed at how big a commitment they made – all of their livestock feeds at the feed store are pink right now in support of breast cancer awareness and in support of breast cancer research as part of their Pink 50 campaign in September and October this year. Are the bags pink in your area? You can get some really good information from infomercials. You just have to exercise self control when it comes to the signing on the dotted line (or picking up the phone to order) part. 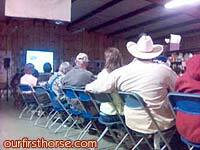 We’ve attended Purina Mills’ Horse Owners Workshop events twice in the past, and enjoyed them very much. They presented good information about horse ownership in general, had a great guest speaker (Sam Powell both times), had free samples of various products (not just Purina), and fed us dinner for free! The event coming up is slightly different. (Here’s a link to Purina’s site.) It’s a live video feed, so I guess there won’t be a guest speaker; I don’t know if there will be samples or not, but I hope so; and since it starts at 7:30 p.m. – and there’s no mention in the flyer – I suspect there will be no free dinner. All the same, we hope to learn some new things. Check out this link to find the Horse Health Fair near you, and if you’re anywhere near Lenoir City, Tennessee on October 18, we’ll be attending the event at Critter Country there that night at 7:30. Come on out!